Braised Brisket with Bourbon Peach Glaze. Sweet and succulent with a crisped dark crust and juicy inside. The perfect bite that melts in your mouth and on your hands. An overnight dry rub imparts a subtle flavor and begins to tenderize this versatile cut. And then a long braise in a beer and bourbon bath in a low oven with herbs and spices, finished with a peach glaze under a hot broiler. Slice and eat! Brisket comes from the breast section of the cow, a boneless cut from under the first five ribs. 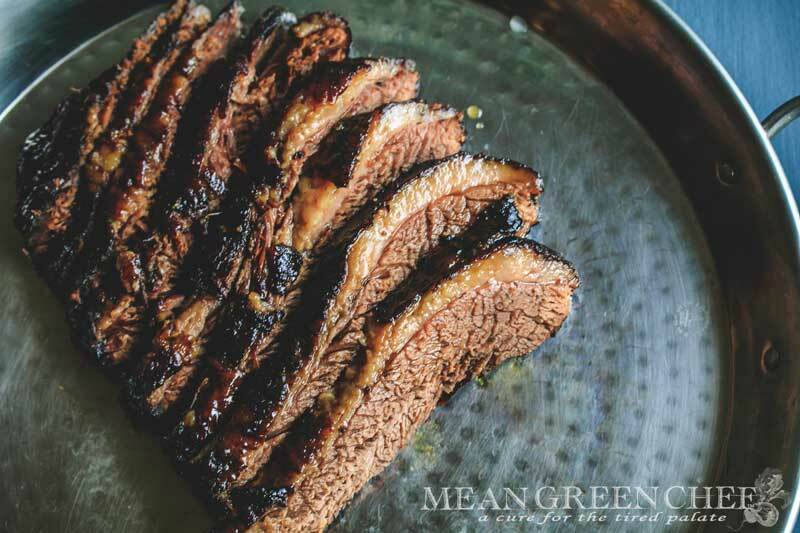 A typical full-sized brisket will weigh in between 8-12 pounds and is about 12-20 inches long, and 12 inches wide. Your butcher will gladly cut a larger piece down to a smaller size. Point Cut: Triangular in shape, has the most flavor and a larger composition of fat running through it than the flat cut. Flat Cut: More rectangular in shape, fat layer runs predominantly along the underside. A modestly priced cut of beef, that responds well to long, slow cooking, which makes it perfect for braising. 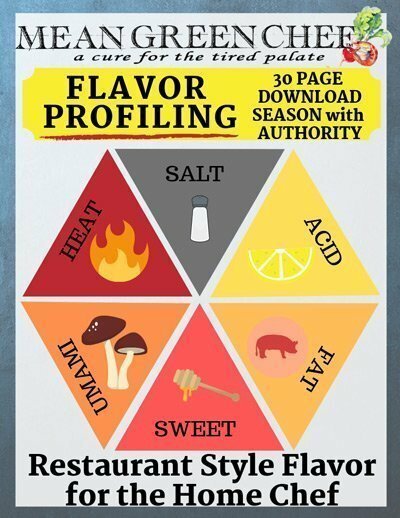 Of course, it‘s also perfect, for grilling, smoking, and the slow cooker. But here we focus on the oven and how to braise this cut properly. Be sure to pick a well-marbled brisket, preferably a cut where the fat is equally distributed in and on the meat. Also, allow the brisket plenty of time to sear on each side. This recipe is for an 8 lb Brisket, you can easily halve for a 4 pound cut of meat. Braised Brisket with Brandy Peach Glaze. Sweet and succulent with a crisped dark crust and juicy inside. The perfect bite that melts in your mouth. An overnight dry rub imparts a subtle flavor and begins to tenderize this versatile cut. A long braise in a beer and bourbon bath in a low oven with herbs and spices and finished with a peach glaze under a hot broiler. Slice and eat! Mix all ingredients in a small bowl, rub brisket all over with spice rub, being sure to rub it in thoroughly. Place on a platter, wrap with plastic wrap and refrigerate overnight. Remove brisket from the fridge and allow to come to come to room temperature, about 1 1/2 hours for 8lbs. (1 hour for 4). Heat 1 tablespoon Vegetable oil in a large heavy bottomed pot or dutch oven (that has a tight-fitting lid) over medium-high heat. Add brisket fat side down, and allow to brown undisturbed for 6-8 minutes. Turn brisket over and allow to brown on the opposite side for 5 minutes. Using tongs transfer to a serving platter. Reduce heat to medium, add remaining 1 tablespoon of vegetable oil. Add onion, celery, carrots, bay leaves, and thyme sprigs, cook stirring frequently for 10 minutes to allow the flavors of the aromatics to begin to release and the tough exteriors to soften. Toss in the crushed garlic and chopped plum tomatoes, cook for an additional 2 minutes. Add the stock, stout, bourbon, light brown sugar, and soy sauce. Stir and bring to a simmer. Place Brisket, fat side up back into the pot. Cover the top of the pot with heavy-duty aluminum foil and then with a tight fitting lid. Transfer to the preheated oven and cook for about 4-5 hours with an internal temperature reading of 165°-175°F/74°-79°C. Brisket should be tender and still maintain its shape. Remove for the pot with a large spatula, set aside on a roasting pan fat side up. Strain the braising liquid into a large bowl. Return the liquid to the pot and bring to a simmer, until reduced to about 3 cups (about 15-20 minutes). Preheat the broiler. Transfer 1/2 cup of reduced braising liquid to food processor or blender, add preserves and bourbon and blend till smooth, season to taste with Kosher sea salt and fresh cracked black pepper. Spoon glaze over the top of the brisket, spreading out evenly. Place the glazed brisket under the broiler, allowing the glaze and fat to darken and crisp about 4-6 minutes. Watching carefully to avoid burning. Remove from oven and allow to rest for at least 15 minutes. Transfer the brisket to a cutting board and slice against the grain, transferring to a platter. Ladle some of the braising liquid over the top along with the remaining preserves.